There are three different variants of squamous cell carcinoma. The first variant is the precursor lesion known as actinic keratosis. Actinic keratosis is scaly red lesion which is poorly defined and may form cutaneous horn type of lesion. Histologically, there will be intracellular bridges, hyperplasia of the basal cell as well as cellular atypia and parakeratosis. The second variant is in situ carcinoma. In situ carcinoma means that squamous cell carcinoma of the skin will not invading the basement membrane. There will be keratin pearls and hyperkeratosis. It is a red well defined scaly lesion in the form of ulcerated nodules or plaque. Histologically there will be cellular atypia at epidermis. The third variant is known as invasive carcinoma. The squamous cell carinoma will invade through the basement membrane. There will be keratin pearls and hyperkeratosis. Histologically there will be sheets of anaplastic epidermal cells. There is also a small case of metastasis of the squamous cell carcinoma of the skin. 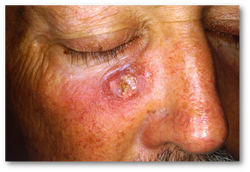 Squamous cell carcinoma of the skin mostly occur as a result of exposure to ultraviolet light, immunosuppression, exposure to tars or radiation, arsenic , tobacco smoking, or genetical disorder known as xeroderma pigmentosum. Xeroderma pigmentosum is an autosomal recessive disorder. This disorder may lead to defect in the gene that is involved in the nucleotide excision repair. The nucleotide excision repair is required to repair the pyrimidine dimers which is formed by ultra violet light exposure. On examination squamous cell carcinoma is presented as red, ulcerating nodules, plaque, on the hand and face. The treatment for squamous cell carcinoma may include surgical excision. 1.LUND HZ. “HOw Often Does Squamous Cell Carcinoma of the Skin Metastasize?” Archives of Dermatology 92, no. 6 (December 1, 1965): 635–637. doi:10.1001/archderm.1965.01600180027004. 2.Callen, J P. “Squamous Cell Carcinoma of the Skin.” Primary Care 5, no. 2 (June 1978): 299–311.